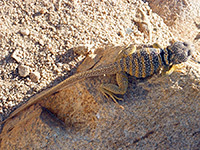 Spectacular views in all directions from the summit, and a great variety of Mojave Desert plants are the two best features of the 1.5 mile path up Ryan Mountain, an isolated peak towards the west side of Joshua Tree National Park that rises 1,000 feet above the mostly flat surroundings. Some sections are steep and rocky but the hike is quite easy, except perhaps in the middle of a hot day in summer, and the path is justifiably popular, being the shortest route to a major summit in the park. The large, well marked trailhead is reached by the Park Boulevard Road, 2 miles east of the turn off for Keys View. Ryan Mountain Trail topographic map. 12 views along the trail to Ryan Mountain. Panorama from the summit of Ryan Mountain. Ryan Mountain is an elongated ridge rather than a single summit, with the highest point (5,461 feet) in the middle. 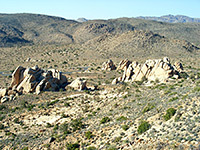 The trail starts at the foot of the northern edge, next to a group of the characteristic piles of granite boulders that litter the western portion of the national park, surrounded by sandy land which provides a good habitat for many yucca and cacti, including opuntia (especially the spineless, pink-flowered beavertail species), cholla and echinocereus. The path ascends steadily, in places via stone steps cut into the white bedrock; it passes above several more granite outcrops, rounds the edge of a hill, crosses a sheltered bowl and climbs towards an intermediate ridge, as the views to the west get steadily more impressive. The next section cuts inwards, away from the edge of the mountain, then the path curves round another shallow valley to the top of the main ridge, where the extensive desert land in the east first comes into view. The last few hundred feet are along the crest southwards to the summit, which is marked by a pile of boulders and an NPS notice, next to a many-branched specimen of banana yucca. 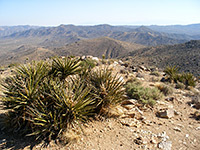 The upper parts of Ryan Mountain are lightly vegetated, covered by scattered small bushes and yucca, without as many cacti as are found lower down. The panorama from the top spans a full 360°, over many different peaks between which are flat desert valleys, punctuated by more of the granite boulders - see panorama. On a clear day even the Salton Sea is supposedly in view, plus the two highest peaks in southern California - San Jacinto and San Gorgonio. Ryan Mountain campground lies below the summit one mile to the west; this is one of the better camps in the park, situated away from the main road at the end of a short gravel track. The campground has 30 sites, quite well separated, arranged around a loop that contains two groups of granite boulders in the middle. The place is much less busy and more peaceful than the larger Hidden Valley campground a few miles north.